2011 3 Comments Written by Nika K.
Jaehoon Lim doing one of his magic tricks involving doves. Photo courtesy of Youtube.com. Hi everyone! So today I’m going to talk about this magic trick that I saw on Youtube. Apparently, this magic show isn’t like any other because it involves different tricks and illusions with doves! 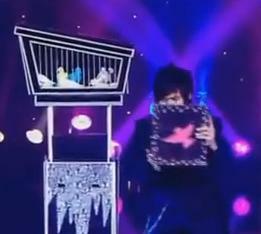 Once I saw this video I was astonished and completely in shock of what the magician could do with the doves! Jaehoon Lim, the magician did so many tricks that impressed the audience! His tricks were so impressive that one of the guys in the audience was in awe and he didn’t move one bit! Some of the tricks that Jaehoon Lim did included flying pieces of cloth and turning doves into confetti. The crowd kept on smiling and clapping to the beat of the music that was playing during the performance. If you want to see the video yourself, the video is at the bottom of this post. You can also comment by clicking “Leave a Comment” which is also at the bottom of this post. If you would want to receive updates from my site, just enter your name and your e-mail and then click sign up. It will then tell you to check your e-mail to clarify that you have just signed up for updates from randomcandies.com. Merry Christmas, everyone! ← Chinese Male Cheerleader Wows Crowd! I also couldn’t move while watching the video! He is GOOD! Wow. That was intriguing. Magic shows are my favorite especially when they look so real. I showed this to my kids and they couldn’t take there eyes off of him.